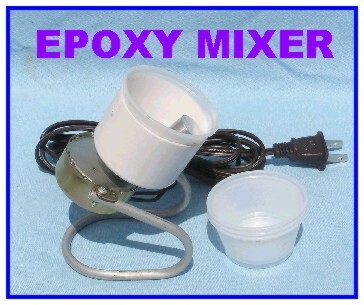 This is a brand new MOTORIZED EPOXY MIXER for Fishing Rod Building. A must have tool for the meticulous rod builder who seeks the finest and most brilliantly clear rod finish possible! This mixer absolutely eliminates the formation of bubbles which result in a fuzzy finish. Mixing is accomplished by rotating a stainless steel mixing rod that gently folds the epoxy over and over in a disposable plastic cup for approximately 3 to 4 minutes. The mixing cup is driven by a brand new 115 Vac motor which operates at 30 rpm. This mixer comes with five replacement cups and written instructions.